Hello, friends of our furry companions! 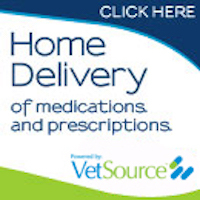 Welcome to the first Mobile Vet to Pet Newsletter! As we begin our Summer and vacations, we wanted to wish you a wonderful and safe season. Summer is a time of barbeques, vacations and outside activities. As we embark on another beautiful hot Summer, we thought you might enjoy some helpful tips to keep our furry family members safe and healthy. We are excited to launch Paws In Print to offer some helpful information to our Vet to Pet Family which will be a quarterly forum for pet news. This will be your newsletter, please help us make it great by letting us know what you like or something that you would like to see in future editions by emailing us at info@myvet2pet.net. Thank you for being part of the Mobile Vet to Pet Family! Leash? Check. Water? Check. Snacks? Check. Okay, you and your furry friend are ready to set off on your adventure… PAUSE! Have you checked the heat index today? During the summer months, some surfaces can reach unbelievable temperatures. Pavement, cement, asphalt, wood, and even sand can become excruciatingly hot during the summer months here in Florida. As the sun beats down on these surfaces, they tend to absorb the heat and then end up staying hot for hours, even after dusk. Check the pavement for heat before taking your dog on a walk. Place the back of your hand, or a bare foot on the surface for 5-10 seconds. If it is too hot for you to keep your hand or foot on it, then it is too hot for your pet. Surfaces can exceed 145 degrees. There are some alternatives and safety tips you should keep in mind. Stay on grassy surfaces and avoid bare ground. Try to avoid the parts of the day when the sun is directly above your head and the hottest parts of the day. Walk early in the morning or late in the evening, but remember to check the surfaces even then because these surfaces absorb the heat. You can also invest in booties or dog socks to help protect paws from the heat. One last tip before you start your adventure, after swimming your dogs paws are more susceptible to hot surfaces. If you see your dog not wanting to walk, or a red or pink color change in the paw pads, or even missing pieces of the pads, be sure to call your veterinarian right away! Leash? Check. Water? Check. Snacks? Check. Ground temperature? Check! Okay, you and your furry friend are now safely ready to set off on your adventure. It’s summer time in Florida and we all know what that means, unbelievably hot and humid months ahead. Taking your pet with you on an outing can be fun for both you and your pet. Your pet gets an adventure and you get a friend who wont back seat drive. Unfortunately, there are cases where people forget their pet is in the car, or leave their pet in the car to make a quick run into a store. The thing is, cracking a window wont always keep your pets safe. If you must leave a pet in the car, make sure you leave the air conditioning on for them. Think about this: in just ten minutes on an 80 degree day, the inside of your car can reach 99 degrees or in that same 10 minutes on a 90 degree day it can reach 109 degrees. The American Veterinary Medical Assoc. has an article specifically about pets in vehicles that everyone should read here. 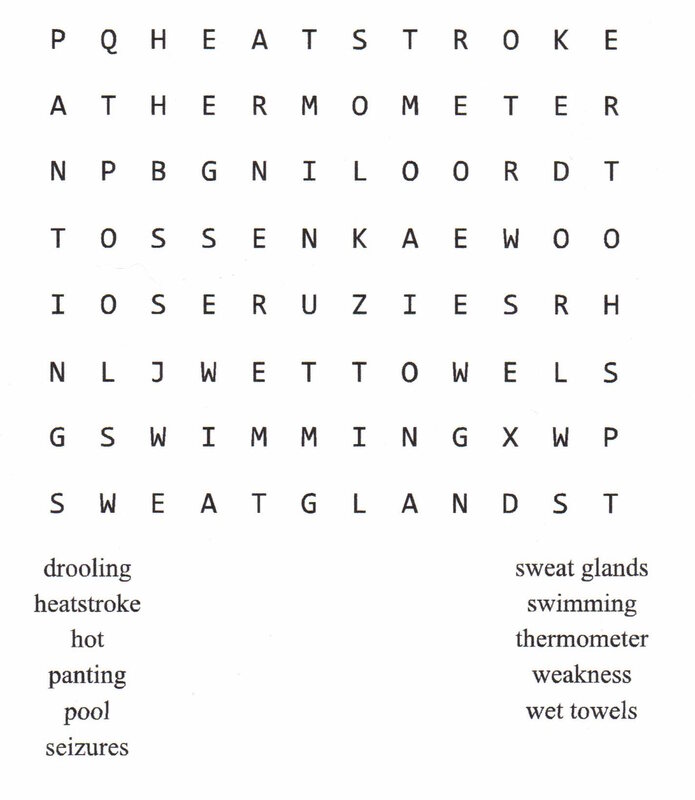 When we get hot, our bodies sweat to cool us off. Dogs and cats, however, only have sweat glands on the pads of their feet. Their primary means of cooling themselves is by panting and a process called convection that exchanges the warm temperature of the animal’s skin for the cooler outside air. Both panting and convection become more difficult if the surrounding air is not significantly cooler than the pets’ body temperature. If these methods of cooling are ineffective, heatstroke can result. Leave a pet alone in a parked vehicle – temperatures inside vehicles can escalate quickly even with the windows rolled down. Forget that surfaces such as concrete or asphalt can get hot – pets can burn the pads of their paws. Let pets be over-active on very hot days – some pets will not restrict their own play if they are having fun. Forget that some pets may have a harder time with hot weather than others: Pugs, French and English bulldogs, Shih Tzus, and Persian cats are examples of breeds that have a shorter muzzle and thus cannot pant as effectively. Pets that are overweight, have heart and lung diseases, or are elderly may be especially susceptible. Allow access to large quantities of fresh, clean water – pets can get dehydrated quickly in the heat. Allow access to shade – the temperature difference between full sun and shade can be significant. Allow safe access to a place to cool off – kiddie pools are great option. Keep pets indoors when it is extremely hot – pets like air-conditioning too! A pet with heat stroke could shows signs of excessive panting or difficulty breathing, drooling, increased heart and respiratory rate, elevated body temperatures of over 104 Degrees F (normal 99.5-102.5 F) weakness, and collapse. In severe cases the pet can have seizures, bloody diarrhea or vomit, and if heatstroke progresses it may ultimately lead to cardiac arrest and death. If the unthinkable happens in your pet appears to be showing signs of heat stroke, immediately remove them from the hot area. 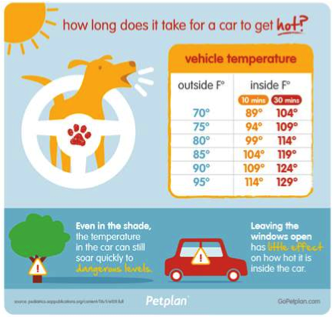 The symptoms of heat stroke can progress rapidly, and it is important to start trying to lower the pet’s temperature as they are being transported to their veterinarian. An initial rectal temperature should be taken in this information should be given to your vet. Offer the pet water if you can drink on its own. begin by wetting down the pet, start at the feet. Cool, wet towels can be placed under the forelimbs and in the groin area; try not to completely cover the pet, even with cool towels, as this can interfere with the convective heat exchange from the skin. Increased air movement with the fan can also be beneficial. Rectal temperature should be taken every five minutes during the cooling process and while the pet is being transported to the vet. It is important to remember that using excessively cold water or cooling the pet too quickly so that their body temperature becomes too low can result in other life-threatening medical conditions. Once body temperature has reached 103°F, cooling measures should be discontinued to that the pet does not continue to lose heat. Even if your pet seems to recover, it is important that they still see a veterinarian as they can become dehydrated or have other complications. Heatstroke can be fatal to our pets, and is completely preventable. No one would want to be outside jogging or locked in a hot car while wearing a fur coat on a hot summer day! Living in the Sunshine state gives us plenty of access to lakes, rivers, canals, and the ocean. Many pet owners have pools as well. Water is everywhere. Many of you swim at home, take your pets for a walk on the beach or on the boat for an outing. Not all dogs know how to swim, but there are some that really enjoy the water whether chasing a ball or just swimming. One of the most dangerous bodies of water for a dog is the family pool. Pools can be dangerous for pets not because our pets aren’t able to swim, but because they sometimes cannot find their way out. Steps can be hard to see from their perspective, because they cannot see the steps under the water. They may continue to paddle in one area where they fell in until they are exhausted and drown, even if the stairs are just a few feet away. To teach your dog how to get out of the pool, take them in and out of the pool several times. Help them to find the stairs until they can find it themselves. Our pets love going on adventures with us, whether it be on simple walk or hiking a state trail. While we love to adventure with our pets, we need to make sure our furry friend stays hydrated as well. Letting your animal drink from streams, creeks, rivers, lakes or even puddles can be potentially life threatening for them. There can be an overwhelming amount of bacteria in the water. One of the common causes of diarrhea in dogs worldwide is Giardia, a common single-celled protozoan parasite. Giardia is transmitted by food and water contaminated with feces. Polluted water can contain other diseases as well, like Leptospirosis. This can cause liver and kidney damage for our pets and its zoonotic; meaning that people can catch the disease as well. These diseases can all be avoided. If your pet becomes ill and you have noticed your dog drinking from a potentially polluted water source make sure to call your veterinarian immediately. To help prevent this from happening, try to invest in a collapsible dog dish, usually made of a pliable material for easy storage, so you can put it in a backpack or keep one in the car. Always carry fresh water with you on outings, remember, if you’re thirsty and hot, your furry friend will probably be thirsty and hot as well.